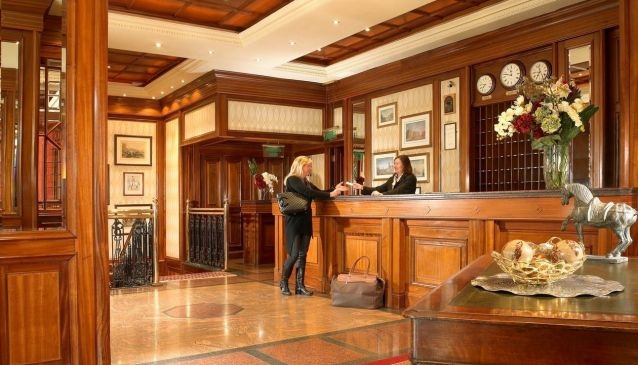 The O'Callaghan Mont Clare Hotel kicks off your stay in style when you step into the elegant lobby which hints at its previous life as a bank. This hotel, the first in the O'Callaghan group, and the square it overlooks are steeped in history. The O'Callaghan Hotels group began here with the bar and nightclub on the ground floor and basement of what became the Mont Clare Hotel. This ideal Merrion Square location is elegant and deceptively quiet, as you're only a short walk away from a wealth of nighspots, restaurants, and retail outlets. For culture vultures, history hounds and architecture buffs, the best feature of all is the bonanza of museums and cultural institutions just outside the front door.